By following this link, you are now leaving www.EPCLUSA.com. This site is not controlled by Gilead Sciences, Inc. Gilead Sciences, Inc. is not responsible for the site's content or your use of the site. HARVONI is a prescription medicine used to treat adults with chronic (lasting a long time) hepatitis C (Hep C) genotype (GT) 1, 4, 5 or 6 infection with or without cirrhosis (compensated). In those with GT 1 and advanced cirrhosis (decompensated) or with GT 1 or 4 with or without cirrhosis (compensated) who have had a liver transplant, HARVONI is used with ribavirin. What is the most important information I should know about HARVONI? Hepatitis B virus reactivation: Before starting HARVONI treatment, your healthcare provider will do blood tests to check for hepatitis B infection. If you have ever had hepatitis B, the hepatitis B virus could become active again during and after treatment with HARVONI. This may cause serious liver problems, including liver failure and death. If you are at risk, your healthcare provider will monitor you during and after taking HARVONI. What should I tell my healthcare provider before taking HARVONI? Tell your healthcare provider about all of your medical conditions, including if you have ever had hepatitis B infection, liver problems other than hepatitis C infection, or a liver transplant; if you have severe kidney problems or are on dialysis; if you have HIV; or if you are pregnant or breastfeeding or plan to become pregnant or breastfeed. It is not known if HARVONI will harm your unborn baby or pass into your breast milk. If you take HARVONI with ribavirin, you should also read the ribavirin Medication Guide for important pregnancy-related information. Tell your healthcare provider and pharmacist about all the medicines you take, including prescription and over-the-counter medicines, vitamins, and herbal supplements. HARVONI and certain other medicines may affect each other, or may cause side effects. Slow heart rate (bradycardia): HARVONI, when taken with amiodarone (Cordarone®, Nexterone®, Pacerone®), a medicine used to treat certain heart problems, may cause slow heart rate, which in some cases has led to death or the need for a pacemaker. Get medical help right away if you take amiodarone with HARVONI and get any of the following symptoms: fainting or near-fainting, dizziness or lightheadedness, not feeling well, weakness, extreme tiredness, shortness of breath, chest pains, confusion, or memory problems. The most common side effects of HARVONI include tiredness, headache, and weakness. Please see Important Facts about HARVONI including Important Warning on hepatitis B reactivation. HARVONI and the HARVONI logo are trademarks of Gilead Sciences, Inc. or its related companies. Hepatitis C (Hep C) affects millions of Americans. Chris was one of them. See how he was cured with the help of EPCLUSA. Cure means the Hep C virus is not detected in the blood when measured three months after treatment is completed. Individual results may vary. Talk to your Hep C Specialist to see if EPCLUSA is right for you. 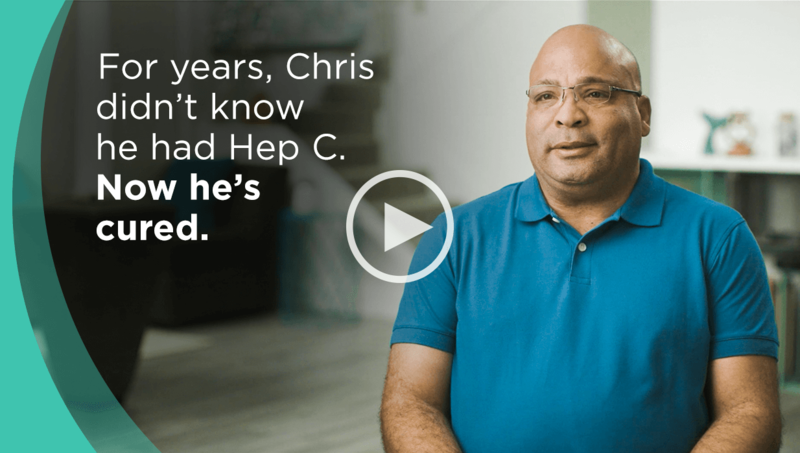 If your Hep C was cured with EPCLUSA, you can share your story here. What is the most important information I should know about EPCLUSA? Hepatitis B virus reactivation: Before starting EPCLUSA treatment, your healthcare provider will do blood tests to check for hepatitis B infection. If you have ever had hepatitis B, the hepatitis B virus could become active again during and after treatment with EPCLUSA. This may cause serious liver problems including liver failure and death. If you are at risk, your healthcare provider will monitor you during and after taking EPCLUSA. What should I tell my healthcare provider before taking EPCLUSA? Tell your healthcare provider about all of your medical conditions, including if you have ever had hepatitis B infection or liver problems other than hepatitis C infection; if you have severe kidney problems or are on dialysis; if you have HIV; or if you are pregnant or breastfeeding, or plan to become pregnant or breastfeed. It is not known if EPCLUSA will harm your unborn baby or pass into your breast milk. If you take EPCLUSA with ribavirin, you should also read the ribavirin Medication Guide for important pregnancy-related information. Tell your healthcare provider and pharmacist about all the medicines you take, including prescription and over-the-counter medicines, vitamins, and herbal supplements. EPCLUSA and certain other medicines may affect each other, or may cause side effects. What are the possible side effects of EPCLUSA? Slow heart rate (bradycardia): EPCLUSA, when taken with amiodarone (Cordarone®, Nexterone®, Pacerone®), a medicine used to treat certain heart problems, may cause slow heart rate. In some cases slow heart rate has led to death or the need for a pacemaker when amiodarone is taken with medicines containing sofosbuvir. Get medical help right away if you take amiodarone with EPCLUSA and get any of the following symptoms: fainting or near-fainting, dizziness or lightheadedness, not feeling well, weakness, extreme tiredness, shortness of breath, chest pains, confusion, or memory problems. The most common side effects of EPCLUSA include headache and tiredness. Tell your healthcare provider if you have any side effect that bothers you or does not go away. You are encouraged to report negative side effects of prescription drugs to the FDA. Visit www.fda.gov/medwatch or call 1﻿-﻿800﻿-﻿FDA﻿-﻿1088. EPCLUSA is a prescription medicine used to treat adults with chronic (lasting a long time) hepatitis C (Hep C) genotype 1, 2, 3, 4, 5, or 6 infection with or without cirrhosis (compensated). In those with advanced cirrhosis (decompensated), EPCLUSA is used with ribavirin. Please see Important Facts about EPCLUSA including Important Warning. EPCLUSA, the EPCLUSA logo, HARVONI, SUPPORT PATH, the SUPPORT PATH logo, GILEAD and the GILEAD logo are trademarks of Gilead Sciences, Inc., or its related companies. All other trademarks referenced herein are the property of their respective owners. The content on this site is intended for US residents only. Patient images are actor portrayals unless otherwise noted. Tap for Use and Important Safety Information about EPCLUSA including Important Warning on hepatitis B reactivation.